How to get a ticket to "Artek"
Perhaps, for a teenager of the 70s-80s one of the memorable events was the purchase of the bike. Especially if it was "Eaglet". Is the highest caste youth bike in the understanding of the Soviet student. He appeared in the middle of 1950-ies one of the Minsk factories and created a furor. "Eaglet" was a Bicycle, two-wheeled transition from child to this adult. Despite the fact that the analogue of the "Eaglet" was "Schoolboy", the last is not popular. It was in a soft sleeve rear wheels. On the "Student" she too quickly fell into disrepair. Another thing Orlyonok, for which the manufacturer has installed a bushing, identical to the present adult bike. Soviet teenager bike played a very different role than modern student. He was a real friend, and the Bicycle brand "eagle" and does not buy every student. This was due to its relatively high cost. And the size of many Soviet apartments were not allowed to put this two-wheeled friend. By the way, the Bicycle "the Schoolboy" was a slightly smaller, but it did not make him popular. The Soviet dream of a teenager weighed 12.5 kg. "Orlyonok" had a rotatable adjustable for individual height chrome wheel. Apart from Minsk, the "Eaglet" was produced in Lithuania. These bikes had the inscription Ereliukas ("Eaglet") on the frame. By the way, the so-called male variety of bicycles with unisex frame. Maiden model with velosipedov of Saulaina bore the name of "Swallow" and different frame. "Eaglet" was designed for travel on any highways. His equipment included a first aid kit tire repair, pump, oiler. For an additional fee you can buy a bike with a headlamp, generator, milometer. Yes, and without all this "Eaglet" became a real boy's wealth. Rather, status. Happy owner of a bike be sure to allow friends to ride a circle or two in sight, warning about careful handling with the "Eaglet". No one was offended, because in the eyes of the children a Bicycle, and even this seemed as. Then on the bikes spent a lot of time, even played tag, as incredible as it may sound. And about jumping and take-offs on the bike in the mountains can not speak. Grown-up host "Eaglet" was often gifting this legendary machine to the younger man. And even a second-hand bike remained a source of pride and envy. According to the recollections of some of the owners of the "Eaglet", he broke down quite often, tantrums. For example, it was off the chain. However, this applies to the first models. Later the famous bike improved. 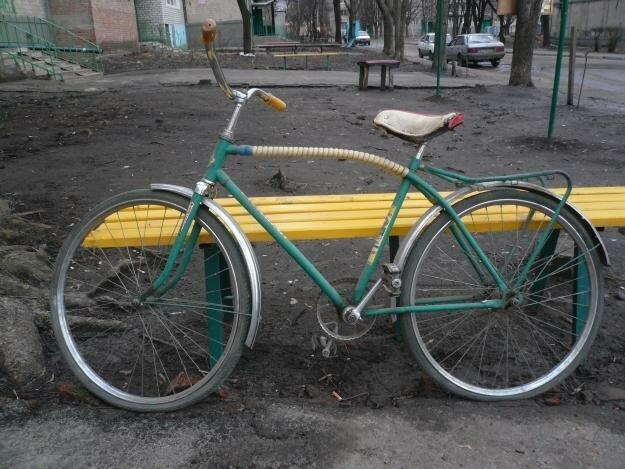 In particular, welded frame, the first models have become such that I had the bike for adults "Ukraine". "Eaglet" became more wide chrome fenders. Generally, for the Soviet youth, the word "eagle" has always been only good of the Association: summer camp, sonorous song and the world's best bike.